This afternoon, Fresquez Productions hosted their pre-fight press conference inside the Route 66 Casino in Albuquerque, New Mexico. The “Havoc” event is scheduled for Friday night and will feature Holly Holm taking on Angela Hayes in the main event with a ten-bout fight card set to fill up the evening’s festivities. Amongst the notable on the card, top flyweight prospect Nick Urso, Mexican prospect Gabriel “Moggly” Benitez and King of the Cage Champion Cody East. Several amateur fights will begin the night of action, most notably a match-up between two undefeated talents. The Jackson-Winkeljohn product Ricky Esquibel (3-0) was once the 104.1 The Edge fighting challenge winner and will now take on Santa Fe’s Jerome Rivera (3-0) in a highly anticipated amateur bout. Home gym representative Clint Roberts will look to get the edge for the Jackson-Winkeljohn camp in their fun rivalry with El Paso’s Bushido MMA gym when he takes on undefeated professional and amateur fighter Eddie Gamboa. The Jackson-Winkeljohn trained Nick Urso is considered by many to be one of New Mexico’s top fighters not-signed by the UFC and with his winning streak getting stronger. Urso is undoubtedly on the right path towards the pinnacle of the sport and he will have a stiff test in Jesus Urbina that he needs to conquer before he gets there. One of the best imports from the Mexican MMA circuit, “Moggly” Benitez didn’t have things go his way in his American debut earlier this year. He will have the opportunity to bounce back but he will not get an easy path back to the winning track as his opponent Rey Trujillo is one of the most seasoned fighters in the regional circuits. Trujillo has been acclimating himself to the area training with Albuquerque’s Lovato Total Fitness and Benitez of course is a product of the Jackson-Winkeljohn gym. Striking Guru Mike Winkeljohn has several of his fighters competing this Friday night at “Havoc” inside the Route 66 Casino. Earlier this year, Cody East captured King of the Cage gold when he won a five-round grueling fight against Nick Rossborrough. The win put East on the map and solidified his placement in the ranks of top-New Mexico fighters. He will look to end his “Fighter of the Year” type year against a very tough opponent in Esteves Jones. In the presser, East spoke about the confidence in his striking. The main event of the evening is a 135-pound clash between elite WMMA prospect Holly Holm, once a decorated World Champion Boxer now converted MMA fighter taking on a seasoned veteran of WMMA in Angela Hayes. 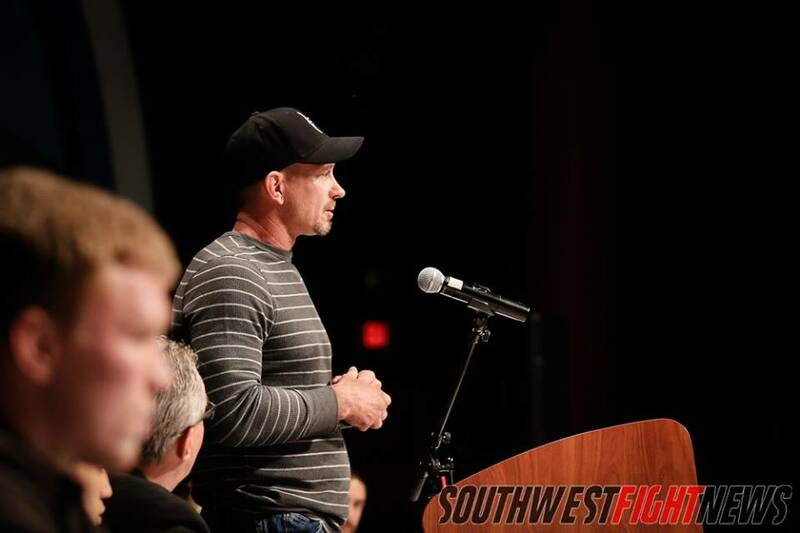 Holm’s striking coach Mike WInkeljohn took to the podium to talk about the evening before the ladies closed the press conference with their last words before Friday night’s fight. Holm’s promoter Lenny Fresquez had a few interesting quotes talking about Holm’s career and her path going forward. At one point, he stated that they have contacted over 60-fighters to fight Holm and they have all declined. He was speaking about how hard it has been to find opponents for Holm. He also mentioned the possibility of Holm going to the UFC. We are eagerly awaiting Friday night’s event, stay tuned to SWFight.com for more event coverage leading up to the fight card which will take place inside the Route 66 Casino.